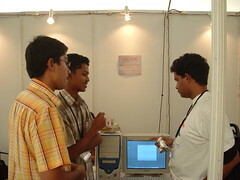 Its been a month since FOSS.IN 2006 got over and I was too lazy to blog about it till now. So I thought I would do it now. Lots of other things like Malayalam support in upcoming Debian GNU/Linux release 4.0 code named etch, reopening of the “chillu” (pure consonants or consonants without vowel sound) encoding debate in indic unicode mailing list, moved to a new project and office shifted to Electronic City … were also happening. I will try to write about some of these, let me start with FOSS.IN. I had written about my participation in my conference handbook just after finishing FOSS.IN so it is kind of easy now. I missed most of the talks except the keynotes since most of the time I was organising/attending BoFs. Day 1 started with keynote from Suparna Bhattacharya. It was great to see such an important linux kernel contributor unknown to most of us till then (Whenever we talk about Indian FOSS contributors we will have one naba Kumar, Gopal V and Philip Tellis and may be some more. I was wondering how many more hidden contributors will be there and so I have started collecting the details of all Indian FOSS contributors here . If you are a contributor, big or small please add your name and contribution there. Also if you see any names missing there please add it). After the keynote got over we were busy setting up the Debian FOSS expo area (We organised a Debian MiniConf during FOSS.IN and more details are here . We installed Debian Etch RC1 in Hindi for the Debian stall and in Tamil for the IndLinux stall as a live Demo of Indic support in Debian Installer. (As mentioned earlier we manged to get Malayalam as well). Hopefully lenny (code name for the release after etch) will have support for all 22 official Indian languages and may be even other unofficial ones and dialects. If you want to join this effort join debian-in. We spent some time in the stall explaining the Debian indic localisation efforts and got some nice comments including one from Prof. Rahul De from IIMB. 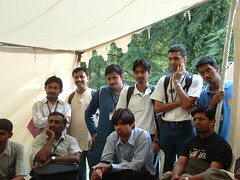 At 3pm we had the Debian indic localisation BoF. We discussed the current status, challnges, future plans and importance of involving users and language experts in the L10n (L10n stands for Localisation – 10 letters in between L and n!) efforts. It was exciting to meet other translators (Kartik Mistry – Gujarati, Priti Patil – Marathi, Thejesh GN – Kannada, Prasad Kadambi – Telugu) and learning from their experience and sharing my experience with Malayalam with them. 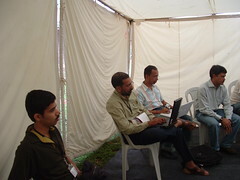 Then I moved to the Indic Computing Workshop by G Karunakar of IndLinux. It was great to learn some technical details of how i18n (internationalisation – 18 letters between i and n) is done which I was not fully aware. First step is internationalising your application – you separate the program and the language part, and second step is localisation – you localise the language part to your local language. GNU gettext help you to internationalise and kbabel/gtranslator help you localise your application. It was time for the closing keynote by Andrew Cowie. It was excellent just like last year. He discussed the fundamental structural problem of the free software community and his suggested solutions. He talked about the classic vi vs emacs, GNOME vs KDE … debates and some positive signs of co-operation in the form FreeDesktop.org. Also he commented on the Novell-Microsoft deal and threat to the Free and Open Source Community as well as the Liberation of java by Sun Microsystems. 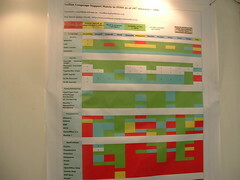 It was interesting as he one of the core developer of java-gnome or gtk for java programmers project. I missed the keynote on day 2 as I got into a wrong bus and landed on somewhere on the way to Yalahanka. I asked the conductor “Tata Institute hogatha?” (Does it got to Tata Institute?) and he said “Banni” (get in). I was a bit suspicious when it took a wrong turn but I thought it might be taking some other root. But it was confirmed when I saw boards like “halli” (village) and the roads were very bad 🙁 Finally asked one of my fellow passengers and got down in the middle and got into an auto and took a bus to Mekhri circle from Hebbal main road. I managed to be on time (after postponing it by half an hour) for the GNU System (aka GNU/Hurd) BoF. We were planning to have a demo but K14 was not out by that time (I have downloaded the CDs and tried it now live during our 2nd weekly hurd.in IRC meet , it is on every Saturday 5:00pm at #hurd.in on FreeNode). We discussed the difficulties for starting with GNU System and the progress made in the last years (X works and GNOME and KDE is almost there- xorg 7.0 is working GNOME is blocked by one bug in gtk but still not recommended for normal use so try it if want to be a part of GNU System development). 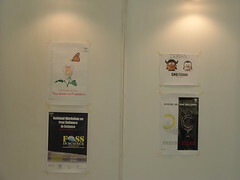 I spent some time in the Debian stall and we started the Debian user BoF. It was interesting to know the experience of some of the longtime Debian users. After that we had the Debian key signing party. Getting your key signed by a DD (an official Debian Developer) is a required step in becoming an official DD (NM process or New Maintainer process). We had two DDs (Thaths and John Leuner from Pritoria, South Africa) participating in the key signing party. Their presence was highly motivating for us DD wannabes (Ramakrishnan Muthukrishan and Ganeshan are other DDs from India. Kapil and Kartik is already in the NM queue). Before you can apply for becoming an official DD with voting rights you have to prove yourself by contributing to Debian – you should be maintainig a package for atleast 6 months before you can apply (an existing DD can sponsor your package). 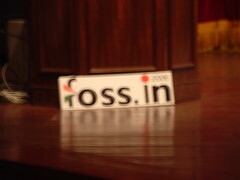 I attended a talk on FOSS licenses by Russel Nelson from of Open Source Initiative (OSI) after that. It was interesting to learn subtle differences and their implications. I asked him about the increasing tendency of using the term “Open Source” for projects (like zimbra, sugarCRM …) which change some of the terms in OSI approved licenses. He said they are working with them to submit their license for review. 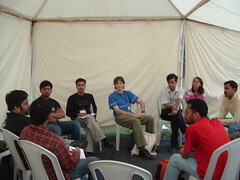 It was time for the exciting panel discussion on 10 years of Linux in India. It was great to hear the experiences of the Indian FOSS veterans. 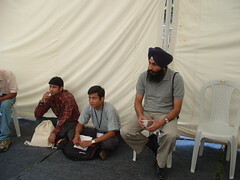 They discussed about the challenges Indian FOSS Contributors facing and their hope for the next 10 years. Karunakar hoped to see 1/6th of the Internet in Indian languages as 1/6th of the world speak Indian languages. You can get the audio of the panel discussion here and video here . 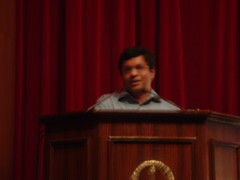 The last day begun with the keynote from Sunil Abraham on the impact of the Indian copyright and Patent law on FOSS. It clarified many legal issues and was an interesting one especially in the light of the proposed amendments. 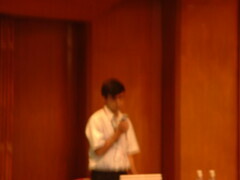 Then I moved to Kartik’s talk on becoming a Debian Developer. He explained the NM process in detail and it was quite encouraging one. Presence of Jehn Leuner made the session even more valuable as he answered some of the questions so did Kapil from IMSc. Then I attended Fred’s talk on ‘Ten Tips To Turbocharge The Team: Getting smaller User-Groups Moving’. In the afternoon section we continued the discussions which was started in the previous day’s panel discussions as two BoFs. The first one was ‘Patching FOSS in India’ which was a very interesting one with veterans like Thaths and Fred actively participating. We have continued that discussions through the mailing lists and here you can see the aggregation of different views as to what is the challenges for Indian FOSS contributors face and some suggested solutions. Some one has asked in the foss.in mailing list how to start contributing and Karunakar started a Dummy HOWTO, which you can see here [Also there are some more HOWTOs here]. 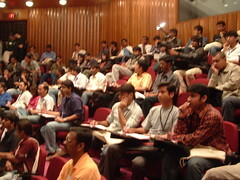 The next session was involving students in FOSS. Many students have participated in the discussions and we have a video of the BoF here . The main challenge seem to be the hectic schedule and uncooperative faculty but there were some examples which proved it was not, notably by Philip Tellis who challenged the teachers to fail him for doing FOSS based project. We had Debian Developers BoF after that and it was yet another interesting BoF. We discussed the NM process and responsibilities of a DD. Then we had one of the most interesting keynote from Tim Pritlov of Creative Chaos club in Berlin. He talked about Hacking as an art form and the responsibility of Hackers – to evaluate technology for the general public and educate them about the problems introduced by technology. He showed videos of hacking electronic voting machines and explained why it is dangerous. Also it was exciting to see them converting a building as a monitor and writing games which people could play against the building using their mobile phones and they called it “blinken lights”. See the video here They explained how it was made and described the setup and showed reactions from the public. They have used each window as a pixel and a light behind the glass shows it as black or white. The positive response motivated them to create even better “blinken lights” with the bulb lighting in 8 steps from off to full brightness. It was even more beautiful with pictures of Monalisa and Che Guvera and an improvement from ping-pong to packman. They have created an application to develop games and enabled people to submit it through email. This has been a highly encouraging and exciting presentation. Then the FOSS.IN team came on stage. Thank you Atul and the FOSS.IN team for making such a great event happen. Keep up the good work. Manish has collected links about the event here. Thanks for the info – it is great to see the FOSS movement in India. Its nice to read the blog. But It does not mention that you “Missed” me 😀 Anyway. I am back in India and will reach bangalore this sunday afternoon. Catch you sometime.